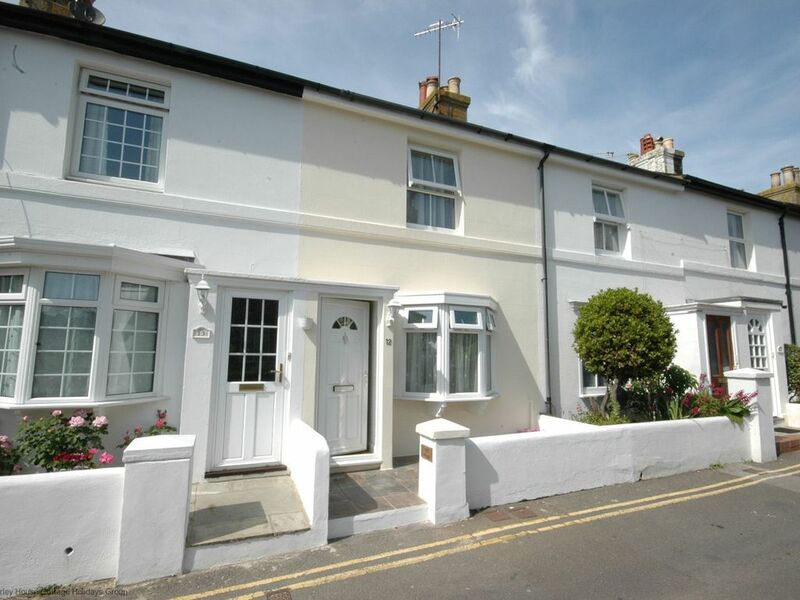 This lovely cottage for four is located just off the high street in Seaford and within 300 metres of the promenade and seafront. Tucked away along a quiet lane, the shops, bars and restaurants are all easily accessible. The cottage also benefits from allocated parking. It offers good space for up to four guests with a living room, dining room and small study area on the ground floor, plus a bright kitchen. To the back there is a private courtyard with outside dining for guests. Upstairs there are two bedrooms, the main bedroom to the front has a king sized bed while the second bedroom is fitted with adult sized bunk beds. The bathroom is modern and fitted with a shower bath. Seaford sits at the foot of Seaford Head. It offers an open promenade that leads to the foot of the cliffs at Seaford Head. There are great walks in particular towards Cuckmere Haven and the Seven Sisters Country Park. Further to the east is Beachy Head and Eastbourne. To the west is Newhaven and then Brighton. Croft Cottage was centrally located. It was very clean and had everything you need for a long comfortable stay. The backyard was a great space to relax and enjoy a meal al fresco. Parking was convenient. If there was only one negative thing to mention is lack of WiFi. We knew WiFi wasn’t included when we booked it; however, after the third day we did begin to miss not having it. Otherwise I highly recommended Croft Cottage. We plan to visit Seaford soon and will definitely stay at Croft Cottage again. Additionally, check out time is 11:00. The cleaning crew was there at 11:00! So be ready to stick to that check out time. Thank you for taking the time to leave a review regarding your recent stay at Croft Cottage, we are delighted to you hear you enjoyed your stay and rate the cottage so highly. Hopefully you will choose to stay with us again soon! Toller Ausgangspunkt für Beachy Head, Steven Sisters, auch London per Zug gut machbar! Sehr zentral. Schnell zum Einkauf oder zum Meer. Gut ausgestattet. Sauber! Gemütlich! Ein liebevoll eingerichtetes, gemütliches Cottage mit wild-romantischem Garten im Zentrum von Seaford und dennoch sehr ruhig. Es ist alles da, damit man/frau sich zu Hause fühlt! Thank you for taking the time to leave a review regarding you recent stay at Croft Cottage and we hope that you choose to stay with us again in the future.